Maria Ashe, a 3rd year PhD student, supervised by Professor John Langley, was recently awarded a Royal Society of Chemistry travel grant and an American Society of Mass Spectrometry (ASMS) grant to attend and present her work at the 66th annual ASMS meeting in San Diego, California. This annual meeting took place over 6 days (2nd- 7th June 2018) and was attended by over 7,800 scientists and comprised of 384 oral presentations and over 3,400 posters. 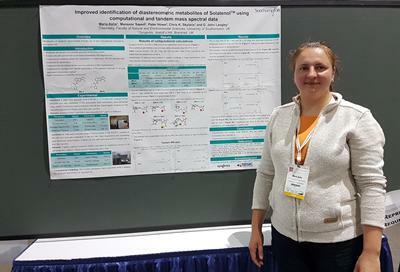 Maria's grants from the Royal Society of Chemistry and ASMS meant that she was able to attend the meeting, where she presented her poster entitled “Improved Identification of Diastereomeric Metabolites of Solatenol™ using Computational and Tandem Mass Spectral Data” and also took the opportunity to attend a short course on high resolution mass spectrometry. Speaking of her presentation, Maria said “the conference gave me a unique opportunity to present my work to mass spectrometrists from all over the world. It was an amazing experience and I learned a lot”. Maria’s work is funded by a BBSRC/Syngenta iCASE award and she was accompanied on the trip by Professor G John Langley and Julie Herniman who also gave poster presentations. They also talked about other work at a Waters Corporation users’ meeting on the use of supercritical fluid chromatography and mass spectrometry to analyse archaeological organic residues.